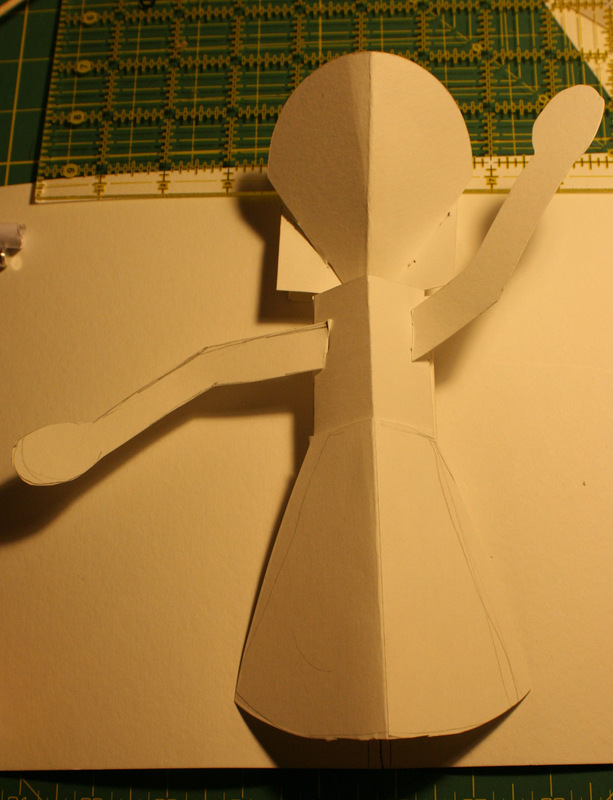 Then there’s the head, which is a simple piece of paper angled in by tabs.Â The body is a “tent” of fabric glued to the bottom platform, and the arms are a “reverse tent”, asymmetric, which brings one arm out at a steeper angle from the page than the other.Â (The top arm angles out towards the viewer, while the arm pointing downwards is nearly parallel to the page. )Â The skirt is just a separate piece glued to the body.. I like this mockup enough, in fact, that I think I will use it as the armature for the Real Thing, covering the face and hands with a skin-tone fabric and “dressing” it in other fabrics, probably handwoven.Â I’ll add hair (yarn), and give her something to hold.Â (I’m still debating between a shuttle (which is my favorite, but unrecognizable except to other weavers), a spindle, and a needle. )Â The one thing I need to change is the background.Â I want the entire background covered in fabric, and that will be easier if I just cut the pop-up off the current page and reglue it to a fabric-covered page. So it’s been a productive and very enjoyable day.Â Playing with pop-ups is FUN! and I’m already thinking of other things I could do with weaving and pop-ups. But first there is the rest of the book to finish, so back to work! I was curious about “pin-up” girl, but the link doesn’t work for me. ??? I’ve fixed the link. Click away! Wow! You’re a brave woman! I’m glad I asked about it. Must’ve taken a chunk of time to paint that.